It is Chikako who is planning events from the background, constantly interfering with Kikuji, pushing women in his direction and then pulling them away from him. First, the young man falls for Mrs. Ota; then events conspire to bring Fumiko into his life. For an experienced reader of Japanese fiction, a happy ending is far from expected, and Kawabata doesn’t fail to satisfy (or disappoint!). 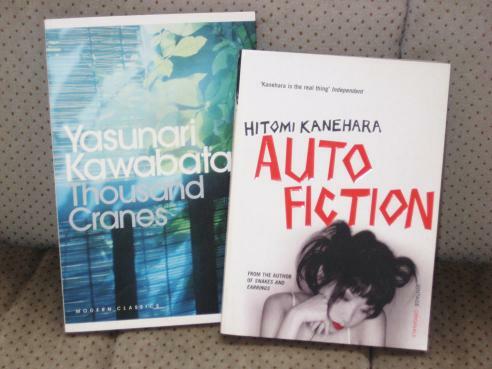 Autofiction, as the title suggests, is loosely based on Kanehara’s own life. In the first section of four, we meet Shin, a young, recently-married woman on her way back to Japan with her husband. He goes to the toilet, she has a panic attack, thinking he is having a good time in there with another woman, and that is how we find out that she is a bit of a… shall we say a nutter? Of course, where there is stress and angst, there is usually a very good reason for it, and Shin is no exception. The reader follows her back in time, to when she was 18, 16 and 15, learning gradually what she has experienced and suffered though, and what exactly has made her so damaged. By the time we make it to the end, or perhaps the start, of the story, we understand, and sympathise, with her feelings a little more. Thoroughly enjoyed Master of Go, more than I expected at the time , and Autofiction (have posted on both books) is one of my favourite books this year so far,already have Snake & Earings on my TBR & am interested on where she'll go next. Also want to read a lot more Kawabata. I read Kanehara's Snakes and Earrings a few years back and was pretty shocked by it. I know it was controversially (but positively) received in Japan and there's also a film which I'd like to see some day. I wasn't really planning on reading Autofiction, but I think I'd like to after reading your post. Established in 1977 by the Shūeisha publishing company to promising new writers of fiction. I read Snakes and Earrings by Kanehara and Out by Kirino, and would say SnE is the more shocking of the two! I was eyeing Autofiction for a while together with SnE, but decided I need to give it a rest after reading SnE. I wouldn't rule out picking it up in the future though. I have also read Snow Country by Kawabata and was lukewarm about it and have not inclined to read his books again. Might pick up Thousand Cranes sometime, since it is so thin. I haven't read either of those- never read anything by these authors. But I've heard of Autofiction and I think I'd like to read it some time. I like the sound of both of these. I've had Snow Country on request at the library for ages. It's a “new” acquisition so it may take months to arrive. I'll have to sus out the ILL situation regarding the others. Parrish – I hope 'Master of Go' is good. I think Kawabata has yet to overly impress me (which is not to say that I don't like his style…). Mee – 'Thousand Cranes' is definitely thin! Good to hear that Kirino is not too shocking (although I'll wait until someone compares 'Autofiction' with 'Out'). Autofiction is a bit like Out in that it deals with a strata if Japanese society not normally perceived. The big difference between the 2 is that Out is a tale about a murder & what ensues, where as Autofiction is about an emotionally damaged individual. For more on out I'll send you my post link as It's a great book . Ps. On Twitter, sorry messed that up. Love Japanese literature though I know what you mean by some of the contemporary stuff … I've read Grotesque by Kirino. Great, but “creepy” (says she in her best literary style). I have Snakes and earrings on my TBR pile but haven't read it yet – off a remainder table from my favourite independent store, but not for $2.50. Our A&R remains open so no deals like that – still I'd rather stores stay open! I've read one Kawabata, The sound of the mountain, and liked it. Family story … multigenerational, aging father starting to “see” his family. Didn't really enjoy A Thousand Cranes, but I'm glad I sampled this Nobel winning author. I'll give another one of his a go someday. I've only read one Kawabata, Beauty and Sadness, which I don't hear much about [in comparison to the likes of Snow Country, A Thousand Cranes, etc.] and enjoyed it a lot. His writing is really beautiful but the drama he created in this story was just great, too. Jeff – 'Beauty and Sadness' is another good one (I think I've reviewed that one on here too), but my favourite is 'The Sound of the Mountain', a great story and good writing.